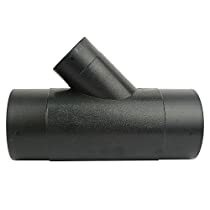 Big Horn's 4-Inch by 2-1/2-Inch Y-connector is used to branch off your dust collection line like a regular Y connector, while reducing your branch off down to 2-1/2-Inch. For best connection use hose clamps (not included). When you need to add a 2-1/2" tap into your 4" dust collector line, this is the right connector to use. Most of my tools have a standard 4" port for dust collection, but I incorporated a 2-1/2" port into the fence of the router table I built. When I first started using it, I had my dust collection system tied into the underside of the router and a shop vac connected to the fence port to collect the wood chips from above the table. It worked fine, but it was a little bit of a pain to set it up. Adding this "Y" into the system allows me to make a single hose connection to the table from my dust collector and it works at least as well as the shop vac did. Hoses fit fine on all three ports of the connector and can be easily secured with clamps. Definitely recommended if you have a need for something like this. I have used many variations of this product in the past but this one is just perfect. Item arrived sooner than expected and was packaged accordingly. This product was exactly what I wanted and when I need more I will certainly order from this vendor. Fits perfectly with 4 inch flex hose. Just right. The inside of the wye is smooth and well formed, and the branch points fit perfectly in the inner diameter of a 4 inch flex pipe. The 2.5 inch branch fits a shop vac pipe perfectly.